The LanBox system provides an intuitive graphical interface for controlling any DMX512 device including stage dimmers, moving lights, fog machines or any other DMX fixture. Photo from "Biggg" at the Gateway Playhouse in Bellport, NY. 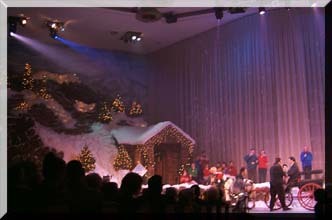 A LanBox-LC was used to control a giant lighted piano keyboard. 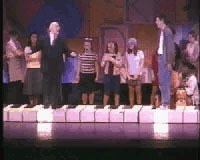 An off stage MIDI keyboard was played and the MIDI data was sent to the LanBox which lit the appropriate "keys" as the actors moved around the keyboard. The LanBox can be used for virtually any application... large or small. To see more about the LanBox and LCedit+, Click Here.